Tournament contenders and local anglers alike chuckled last July as Dylan Nussbaum walked to the bait-shop counter carrying every size 12 Rapala® Down Deep Husky Jerk® in the store. But they weren’t laughing later, when he was crowned champion of the National Walleye Tour tournament on Devils Lake. 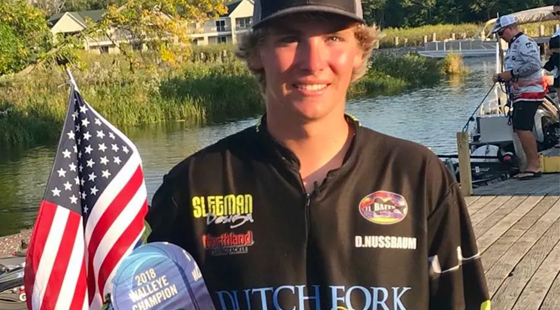 Having figured that out, Nussbaum, now 21, became the youngest pro ever to win a Cabela’s National Walleye Tour tournament. He and his co-angler weighed a five-walleye limit weighing 25.4 pounds on the first day of the tournament and 30.03 pounds on the second day. Nussbaum’s combined weight of 55.43 pounds was 5.6 pounds more than the runner-up angler. “I ended up bringing in just monster bags, both days of the tournament,” he says. Most of Nussbaum’s bites came on No. 12 Down Deep Husky Jerks in the Fire Tiger color pattern. He trolled them in 40 to 45 feet of water on 12-pound-test Sufix 832 Advanced Lead Core line. A native of St. Mary’s, Pennsylvania, Nussbaum considers nearby Kinzua Reservoir his home water. It was on that waterbody, located about an hour from home, that at age 9 or 10, he fished in his first tournament. “And after that, I was pretty much hooked,” he says. Nussbaum’s “number-one favorite Rapala lure” is a Flat Jig in the Parrot Flake color pattern. It was with that bait that he won the inaugural Champions Tour Walleye Event on Minnesota’s Lake Mille Lacs. The Champions Tour Walleye Event is a catch-weigh-release tournament. Every legal “keeper” walleye is caught and weighed by an in-boat official and then immediately released back into the water. A competitors’ score is the cumulative weight of all the keepers caught and weighed. The competition day is split into two periods, each contested on a separate zone on the host waterbody. Nussbaum jumped to an impressive lead early, weighing 55 pounds in the first period. He was fishing in 10 feet of water, vertical jigging and casting a 1 3/16ths ounce Parrot Flake-pattern Flat Jig around small humps. “It was just game on,” he says. A Rapala Flat Jig looks like a Jigging Rap with a flatter body, but familiar hook and tail profile. That profile creates a responsive, long-gliding searching action. Down Deep Husky Jerks come in 24 color patterns to cover any situation an angler faces. In addition to their forage-mimicking visual appeal, these deep-running plugs feature tuned, internal rattle chambers to add loud, rhythmic attraction. Their premium VMC black-nickel hooks keep even bigguns buttoned on. Neutral buoyancy allows them to suspend during a pause in your retrieve. Each one is hand-tuned and tank-tested to swim perfectly right out of the box. Like Jigging Raps, Flat Jigs feature a balanced, weighted-minnow profile and swim with a long-gliding, wide-searching action. Armed with single reversed hooks on the nose and posterior, as well as a center treble hook hung from a belly eyelet, they don’t allow for missed bites. Long predominant as ice-fishing lures, Jigging Raps in the last few years were proven equally productive as open-water baits after several Rapala pros and others won or placed high with them in major tournaments. The Flat Jig builds on that success, expanding on the Jigging Rap technique for different conditions. At 80 percent heavier than a Jigging Rap of similar length, a Flat Jig will produce in even heavy current and very deep water. The 1 ½-inch Flat Jig weighs 9/16ths of an ounce. The 2 ½-inch model weighs 1 and 3/16th ounces. Both are available in 10 color patterns: Flake Parrot; Flake Clown; Flake Gold Olive; Flake Blue; Flake Silver; Flake Silver Shad; Glow Pearl Blue; Glow Pearl Olive; Holo-Flake Anchovy; Holo-Flake Gold Fluorescent Red.